One day … seven nonprofits … 40 students … 960 hours … $27,600 in donated work … that’s how successful the Capstone Agency’s 2017 CreateAthon was, and it’s not over yet. Capstone Agency, The University of Alabama’s student-run communications firm, will host its second annual CreateAthon, a 24-hour marketing marathon, Feb. 16-17. With more than 75 members participating and 11 partnering nonprofits, the agency aims to exceed $45,000 in donated work. In a recent collaboration with the Public Relations Student Society of America National, the organization chose five nationally affiliated, student-run firms to host CreateAthon on their individual campuses. CreateAthon, a national 501(c)(3) organization, rallies established marketing firms to serve in 24-hour marathons, delivering the communication strategies and materials nonprofits need to move their missions forward. Since its founding in 1998, CreateAthon has collaborated with more than 100 marketing and communications firms, universities and corporations. As a result, participants have helped over 1,500 nonprofit organizations in the United States, Canada and the United Kingdom by delivering more than $24 million in pro-bono marketing projects. 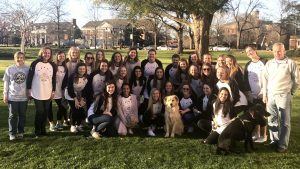 CreateAthon provides Capstone Agency with the opportunity to make a lasting impact on the community, an impact that has three nonprofits — Campfire Alabama, Tuscaloosa Metro Animal Shelter, and Alabama Writers Conclave — returning for more. “We are grateful for the work Capstone Agency did for us in 2017 and look forward to the opportunity to work with them again,” Sian Eastwood said, outreach director of Camp Fire Alabama. The eleven nonprofits selected include Alabama Writers Conclave, Boys & Girls Club of West Alabama, Family Counseling Service, JC’s Place, Lifeline Children’s Services, West Alabama Food Bank, Campfire Alabama, Tuscaloosa Metro Animal Shelter, FOCUS on Senior Citizens, Child Abuse Prevention Services of Tuscaloosa and Freshwater Land Trust.